As winter rolls around just in time for the start of 2016, the past winter that we had is definitely worth a second look as it may be one to remember for a long time to come. The hatred of snowstorms is usually heard loud and clean in these parts, but for me, the unique changes they bring are visually entertaining and I would have to say rather welcomed. I am a big believer that beauty can be found on any given day, whether it be the pleasantries of a spring afternoon or a dreadful rainstorm on a cold December morning… but when a storm rolls into town, its more unique than most other days in the year. 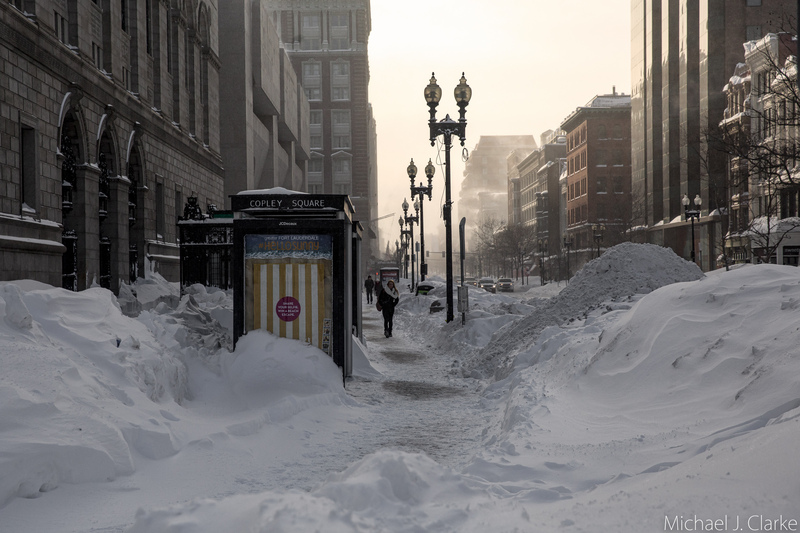 This past year happened to bring several major snowstorms that walloped Boston into a state of emergency with the trains and city streets simply unable to handle the challenges that they let loose on the city. I was one of the brave souls that ventured out during the most extreme of the weather, and the sights and sounds were more impressive than anything I can remember in Boston’s snow history. One thing that impressed me last winter was that as much as the snow kept coming, people kept carrying on with their days, or at least trying their best. Yes, the trains ground to a halt, traffic was nearly unbearable, short commutes turned into hours, but for the most part, people kept on trucking as well as they could. Walking seemed hard enough, but some people even kept pedaling away on bikes almost in spite of how cold it was! Making pictures of these street scenes in their snow-altered state is a lot of fun for me as a photographer, and there is always the choice of attempting to capture the misery vs. the beauty of the scene. On some days its either all of one or the other, but oftentimes theres a good bit of both – you have to admit that the city looks pretty amazing under its blanket of snow when seen from above even while the streets below were transformed into a hard to recognize winter wonderland. Perhaps the beauty of the snow was lost to many people because of the problems with the trains, which were rather epic with their endless delays and even closures. Many people lost many hours waiting and hoping for transport, or possibly waiting or hoping to be somewhere a whole lot warmer than here! For a few tips on how to make snowstorms in the city easier do your best to plan for it. We had a little preview of winter over the past few days, and I will venture to guess that a whole lot more is right around the corner. It’ll be cold and slow going, but this is New England, and I say let it snow.